This is so sweet. I love the pram! Such a pretty card. Really lovely. 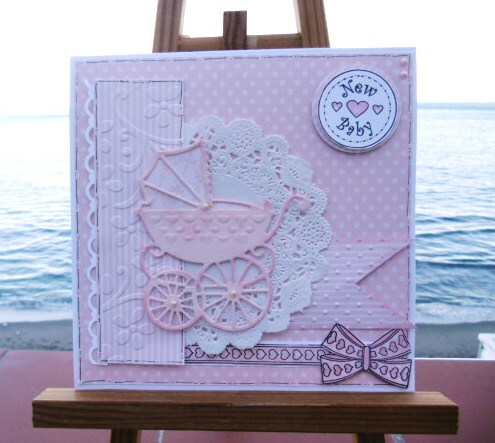 Fab card, I just love the pram its stunning! This is so gorgeous Sylvie; a perfect new baby card. The pram die is gorgeous. Sylvie What a stunner . Beautiful and delicate baby card. I love it. Wish you great weekend. Hey Miss Artist! Gorgeous card and I love the dots and texture. Yum!! oh wow this is fabulous! I love the colour but then again it is my favourite! Thanks for joining in at WSC THIS WEEK.